Home / Deals and Promos / MyPhone / Promos / [Promo Alert] Get a MyPhone Iceberg for only P8,988! 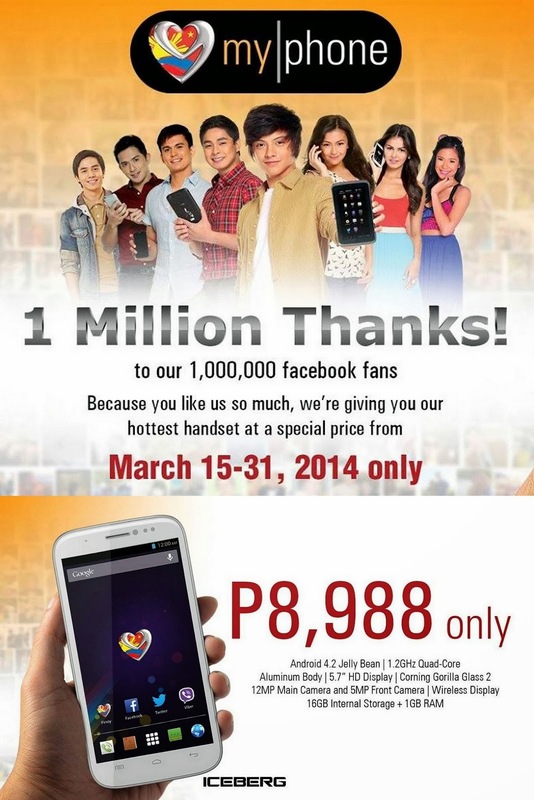 [Promo Alert] Get a MyPhone Iceberg for only P8,988! MyPhone has recently hit 1 Million fans on Facebook and because of that, they are giving a 25% Off on MyPhone's premium smartphone. Get a MyPhone Iceberg for only P8,988 from March 15-31, 2014. The SRP is P11,988. Simply print MyPhone's ad on Facebook (here) and visit participating MyPhone Concept Stores and Kiosks to get an Iceberg at an exclusive price of P8,988.